There are several ways that heat is transferred into your home. One of them is by thermal radiation. Infrared energy from the sun travels until it strikes a surface before giving up its energy as heat to that surface. If you have ever been outside on a very cold windless day and felt the warmth of the sun, you have experienced thermal radiation. In the summer thermal radiation strikes the surfaces of your attic increasing temperatures to as much as 150 degrees, this heat energy radiates downward into living areas, creating upper floors that are hot and uncomfortable. This also creates a strain on air conditioning systems as they try to keep up with the heat gain, creating an unnecessary energy expense. One solution to this problem is to install a foil thermal barrier. 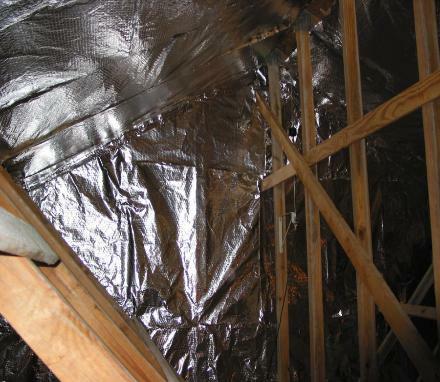 The foil can be placed on the underside of your roof structure within the attic space. A foil barrier of this type can reflect up to 90% of the thermal radiation from the sun, and reduce attic temperatures by up to 40 degrees. Cooling energy savings can be quite dramatic, usually around 20% to 30%. The reflective barrier can also be spray applied, or in the case of new construction, plywood sheathing is now available with a foil membrane applied to the interior attic side. If you are looking for a great do it yourself project that can pay for itself in the first year and create a more comfortable environment, we recommend installing a radiant foil barrier. Every wonder what is keeping the rain out. Your roof, that’s what. Ever wonder what type of roof you have? Probably not, but it is one of the most important parts of your home. There are many types of roofing systems ranging from typical asphalt shingles to zinc clad metals and everything in between. One of the most environmentally friendly roofing material is metal. Metal roofing first and foremost is 100% recyclable. That is an extremely significant number. There are very few materials used for the construction of your home that can boast that type of recyclability. Another nice aspect of the metal roof is that the coatings out there offer a “cooling effect” in that much of the heat is reflected away from your home resulting in lower energy costs. By reducing energy consumption from heating and cooling your home you will reduce your over all footprint on the environment. Over the years you will be surprised by the savings both environmentally and financially. If you install a new metal roof you will be installing most likely the last roof you will ever need. They help protect from fire, they are very durable and can be very aesthetically beautiful. The next time you thing about a roof think again and investigate.